The Act was challenged under the provisions of Article 29 of the Soulbury Constitution, which forbade discrimination against any segment of the population. That clause was supposed to be entrenched, in that it could not be changed without a 2/3 majority of Parliament, which Soulbury had believed no party would ever achieve. The Official Languages Act was passed with a simple majority, and the Sri Lankan courts seemed to find against some of its provisions, but the government appealed to the Privy Council in Britain which, under the Soulbury Dominion Constitution, had the final say. Unfortunately the Privy Council, which followed the British tradition of subscribing in general to the supremacy of Parliament, upheld the legality of the Act. Bandaranaike, who had been the first advocate of Federalism on his return to Sri Lanka from Oxford in the 1920s, soon realized the need for compromise. He negotiated a pact with Chelvanayakam, who was the undisputed leader of the Tamils now since the Federal Party, in the reaction to Sinhala nationalism, had routed the Tamil Congress and the UNP in the North. The substance of their agreement was the establishment of Regional Councils, which would exercise executive authority in many of the areas of government in provincial areas. Crucial to the agreement was the recognition that, with Sinhala the language of administration of the central government, the people of the north and east who functioned in Tamil needed an administration which functioned in their language with regard to the day to day business of government. Unfortunately the UNP under J R Jayewardene vehemently opposed the pact, and tried to whip up feeling in the country against it. This strengthened the hand of the nationalists in Bandaranaike’s party, led by Vimala Wijewardene who was married to one of Jayewardene’s maternal uncles. Bandaranaike weakly tore up the pact in a welter of communal violence that was only stopped when he handed over control of the situation, under Emergency Regulations, to the Governor General, Sir Oliver Goonetilleke, a former UNP Minister who had been D S Senanayake’s right hand man in the Soulbury negotiations. Bandaranaike was assassinated in 1959 by a Buddhist monk, though this was probably due more to intrigues based on personal ambition than to nationalism. The election that followed proved inconclusive and Dudley Senanayake, who was back at the helm of the UNP, and became Prime Minsiter in March 1960, decided to dissolve Parliament when he was defeated in the Throne Speech, instead of actively pursuing accommodation with the SLFP or the FP (or allowing them to try to set up a coalition together). 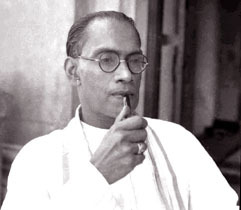 The FP continued to agitate as well as negotiate, and reached an interim agreement with Mrs Bandaranaike, who won the July 1960 election, to allow the reasonable use of Tamil in the provinces where it was the language of the majority. Unfortunately no attempt was made to amend the Official Languages Act, which was a simplistic document consisting of a single sentence with no clear guidelines as to what this entailed. Mrs Bandaranaike’s majority was shaky, which prompted her to negotiate a coalition with the Marxist parties. This led to some members of the SLFP abandoning her, for a variety of reasons, some involving financial considerations. Having lost a vote on the Throne Speech in 1964 she had the Governor General dissolve Parliament. The UNP under Dudley Senanayake failed to win a majority, but formed a coalition government with the support of both the FP and the TC. Crucial to their support was agreement to devolve power through District Councils, smaller units than the Regional Councils originally agreed on by Bandaranaike and Chelvanayakam. This concession on Chelvanayakam’s part did not help. Mrs Bandarnaike campaigned against the proposals and so did the General Secretary of the UNP, Cyril Mathew, who had been Jayewardene’s right hand man in his rebuilding of the UNP during the fifties. Though Mathew was sacked from his post, Senanayake was uncertain about Jayewardene’s attitude, with mutual suspicions developing between the two at this stage. More graciously than Bandaranaike, but equally pusillanimously, he abandoned the agreement in 1968. The FP Minister in the Cabinet (Senator Thiruchelvam) resigned, but the party continued to support the government so that it served a five year term. Mrs Bandaranaike and her Marxist allies won an overwhelming majority in the 1970 election, as an United Socialist Alliance, and proceeded to adopt a new Constitution as pledged in their election manifesto. They set up a Constitutional Assembly for this purpose, but unfortunately did not take into serious consideration the views of other parties. Jayewardene seemed initially inclined to cooperate, but the UNP was riven by infighting in those years, resolved only by Senanayake’s premature death in 1973, and the USA did not pursue consensus. They also ignored Tamil aspirations, and abolished Article 29, substituting in its place a provision that forbade discrimination but asserted that Buddhism would have the foremost place in Sri Lanka, now the country’s official name. The new Constitution also extended the term of Parliament to six years, and extended the lifetime of the existing parliament to 1977. The argument was that it had sacrificed some of the period of its mandate in dealing with the armed insurrection launched by the Janatha Vimukthi Peramuna, and in formulating a new Constitution, but in effect it was simply an act of self-assertion based on the overwhelming majority the government possessed in Parliament. So in the 1970s the various Tamil parties came together to form a Tamil United Liberation Front, which fought the next election on the basis of asserting the right of the Tamil speaking people to self-determination, with reference in particular to the Northern and Eastern Provinces. Initially the Ceylon Workers Congress, the party of the Indian Tamils, who worked on the plantations in the centre of the country, was also part of the TULF. They won an overwhelming majority of seats in the North and East in the 1977 election, and emerged as the major opposition party since the constituent parties of the USA, having parted company in 1975, were decimated. Jayewardene had made much, in his election campaign, of Tamil grievances, and had promised to summon an all-party conference to resolve these. However, possessed now of an even larger majority of his own, he too got carried away by the overwhelming authority he enjoyed. Instead of broadbased negotiations, he engaged in discussions with some representatives of the TULF, while simultaneously trying to undermine their mandate. Thondaman, the leader of the CWC, joined his government, and so did some TULF members from the Eastern Province. By this stage both Chelvanayakam and Ponnambalam, both essentially denizens of Colombo even though their political base was in the north, had died. They had survived into the seventies to bring their parties together again after the promulgation of the 1972 Constitution, but they died shortly afterwards so leadership for the election campaign had passed to A Amirthalingam, who was fully based in the north. He did not actively engage in the negotiations himself, but left them to Colombo based Tamils, mainly Chelvanayakam’s son-in-law and Thiruchelvam’s son. The final agreement was for the establishment of District Development Councils, which had even fewer powers than the District Councils Senanayake had agreed to. The Chief Executive of the District was to be a Minister, who was not to be elected by the District or the District Council, but was instead appointed by the President from amongst members of Parliament. Jayewardene affirmed a principle of not appointing individuals from the District they were supposed to preside over, so that the District Minister for Jaffna for instance came from the Northwestern Province. The TULF negotiators had produced a dissenting report, but the party nevertheless decided to participate in the election, that was held in 1981. The SLFP boycotted that election, though it was contested by the JVP, which had joined the political mainstream after Jayewardene released its leaders who had been jailed after the 1971 insurrection. As far as the TULF went, some of their younger supporters, who had started terrorist activity in the seventies but supported the party in the general election, urged a boycott, but the TULF was powerful enough to ignore them. Jayewardene however sent Mathew up to Jaffna to run the UNP campaign for the Jaffna District, and he launched a campaign of intimidation that included burning the Jaffna Public Library and attacking the homes of TULF Members of Parliament. That incident marked the end of the influence of political parties amongst the Tamils of the north, and over the next few years the terrorist groups, in particular the Liberation Tigers of Tamil Eelam, emerged as the dominant force in the area. When the TULF tried to contest local elections in the north in 1982, they were ordered to desist, and they promptly complied. The District Development Councils might have helped to resolve some of the grievances of the Tamils, but they ran into administrative roadblocks since they were almost wholly dependent on the central administration for funds as well as implementing authority in several respects. Meanwhile the terrorist movements were getting stronger, and received support from India. In 1987 Jayewardene finally realized that he had been totally outmaneuvered, and he signed an Accord with India according to which Provincial Councils with substantial powers were to be established. However the main thrust of the Accord was to ensure that Sri Lankan foreign policy did not step out of line as far as India was concerned. This was a period when Cold War rivalries badly affected the Indian subcontinent, and some of Jayewardene’s activities had roused Indian suspicions. That was the major reason for Indian intervention and, once their fears were put to rest, they were not as concerned about the details of the devolution package as the terrorist groups were. The LTTE therefore ended up rejecting the Accord, and the Provincial Council established under its provisions for the Tamils. This was for a combined Northeastern Province, since the idea of a traditional Tamil homeland comprising those two Provinces had been the basis of the TULF claim for self-determination. However, while the Northern Province was almost wholly Tamil, the Eastern Province had substantial numbers of Sinhalese and Muslims. Though these last were Tamil speaking, they had a distinct identity and did not wish to be subject to Tamil majoritarianism in the way Tamil speakers had been subject to the majoritarianism of politicians representing Sinhala speakers in the period after independence. The solution of the Indo-Lankan Accord to this dilemma was what was termed a temporary merger of the two provinces, subject to a referendum. It is claimed that Jayewardene promised that such a referendum would never be held, but in the period immediately after the Accord there were allegations that members of his government as well as Tamils began a process of shifting populations in preparation for the vote. Underlying such allegations was a fundamental problem regarding the nature of the devolution package – was it aimed at satisfying nationalist aspirations, based on past discrimination, or was it intended to ensure more effective government for all sections of the population? What is finally desirable, it would seem, is specific powers to smaller units that can deal with day to day problems, combined with larger units that can take policy decisions on matters more related to regional rather than central priorities. That would be in accordance with the principle of subsidiarity discussed above. However, in the context of emotional responses given the history of the last half century, that sort of approach will require much effort to initiate, and more trust than is now available on any side. There is another area in which the Provincial Councils Act passed in Parliament in 1987 has grave shortcomings. Executive powers are divided into three schedules, those exercised by the center, those exercised by the province, and those exercised jointly. However, according to the Act, if there is a conflict between central and provincial legislation regarding matters in the third schedule, the central legislation will prevail – which in effect nullifies the idea of a joint list. Combined with this was the introduction into the first schedule of concepts of national policy and national institutions without defining their provenance. Thus the clear need of at least administrative control of education was subverted for instance by the central Minister being able to declare any school he wished a national school, thus removing it from the purview of the provincial Education authorities. Strengthening provincial institutions so they could respond to local needs could become difficult in such a context. In any case, suitable though the Province might be for the making of policy in certain areas where group interests are at stake, for administrative issues smaller units are clearly desirable. The situation in the Northeast makes clear the problems caused by legislation that failed to consider all the dimensions involved. For government employees to have to travel to the Provincial capital is in some cases more difficult than getting to Colombo. Capacity in the Province is also limited, and strengthening this to deal with comparatively large areas is not easy. It would make infinitely more sense to devolve many administrative matters to smaller units, and this in fact was envisaged by President Premadasa in his local government reforms in the nineties. However he failed sufficiently to clarify and streamline the various areas of responsibility so that, while suspicions arose that these measures would undermine the powers of the Provinces, the proliferation of unnecessary layers of decision making was not satisfactorily addressed. Finally, the Provincial Councils Act does not address at all the question of ensuring adequate representation of the Provinces at the centre. Given that, in a united country, whatever powers are devolved, there will remain certain powers at the center, it is necessary to ensure that those are not exercised by sections of the country at the expense of others. Introducing a second chamber based on provinces would help with this, as would the reintroduction of the sort of Committee system that maximized participation in executive decisions during the period of the Donoughmore Constitution. But since the approach has been the resolution of immediate problems, rather than consideration of underlying principles, such areas, which would help in ensuring a comprehensive solution to the various problems that have arisen, are never considered. Representation in Sri Lanka has been formulated by blind adherence to custom, rather than consideration in the light of fundamental principles of the particular problems to be resolved.